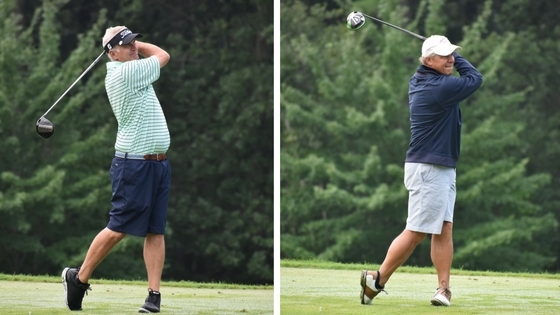 Nashua, NH – With some of New Hampshire’s top senior golfers in the field, the side of Craig Steckowych (Portsmouth CC) and Danny Arvanitis (Derryfield CC) are leading the way following Round 1 of the Senior Four Ball Championship at Sky Meadow Country Club. The duo fired the low round of 67 (-5) which is good enough to lead by one stroke. Steckowych and Arvanitis started out the day strong, both making birdie on the par-4 opening hole at Sky Meadow. From there, they went on to make three more birdies on the front nine to make the turn at 4-under par. Though they only had one birdie on their back nine, they were able to play team golf well, with one making par when the other was not able to. Steckowych shot 1-under on his own ball, while Arvanitis shot even-par on his own ball, combining for a great team score. Following in behind them is the team of Bob Landry (Loudon CC) and Mike Blair (Bretwood GC) who finished at 68 (-4). Able to avoid bogeys, Landry and Blair went back and forth making birdie or par all day to get themselves into prime position to chase down the leaders in Round 2. Only two shots off the lead at 3-under par are Bill Krueger and Bob Mielcarz, both Concord Country Club members. Starting out the day on a strong note, Krueger went 1-under par on his own ball on the front nine with Mielcarz adding in pars where Krueger fell short of par; the two turned at 3-under par. Though their back nine saw two bogeys, they were able to keep themselves to 3-under par for a total of 69 in Round 1. They too will look to chase down Arvanitis and Steckowych in the final round. Sky Meadow Country Club is playing to about 6,300 for this tournament with some challenging holes. One of the more challenging holes is the par-3 2nd hole that played to 213 yards in Round 1. Playing who will be able to navigate the rainy conditions in Round 2 will end up successful at the end of the tournament.